27-30 May - A few days spent visiting our families in South Wales. A long overdue but very enjoyable time in very warm weather. 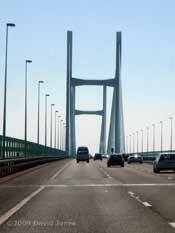 31 May - We travelled down to Cornwall on another 'blue sky day', going over the River Severn bridge at a quiet time on the M4 motorway. In fact, the whole journey was surprisingly quiet, with most traffic heading the opposite way as families headed home after their half-term holidays. The highlight of the trip came when we stopped to have a picnic (and a long break) on Bodmin Moor. 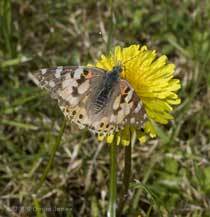 We had read that there had been a mass migration of Painted Lady butterflies into the south-east of the UK last week. Well, we met up with a few of them on Bodmin. We stayed for around an hour and a half there in the mid afternoon, and during that time we must have seen hundreds of the butterflies pass us by, all heading south-west, as if towards the afternoon sun. While most were flying quite close to the ground we only saw the occasional individual land, and then only for a brief pause before continuing its journey. I spent ages trying to get a photograph. 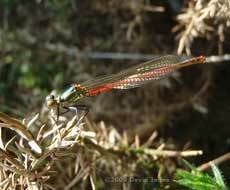 I also came across this beautifully coloured damselfly amongst the Gorse. It looks like a Large Red Damselfly (Pyrrhosoma nymphula). 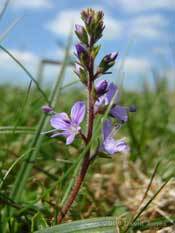 Small, but nevertheless very noticeable in the areas of rough grass between the clumps of Gorse were these purple flowers of what may be Heath Speedwell (Veronica officinalis) - I need to take a better look next time I pass this way! 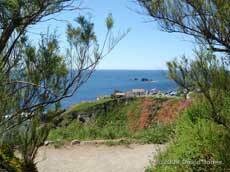 When we arrived at Pinetrees, our usual destination down on the Lizard peninsular, it was a different journey's end to usual for us as we have not brought our caravan this time. Instead, we are staying in one of Pat's holiday bungalows. 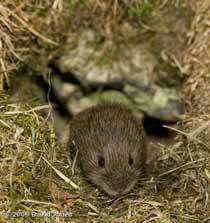 During the evening, as we unpacked I was treated to another special treat when I spotted a vole popping in and out of a hole just a couple of yards from the bungalow, and in full view through a window at 8pm - a photographic challenge for the 'evenings at home'! 1 June - The skies remained cloudless, and the temperatures high (I understand they reached 28C in some places, although I don't know what they were locally). For us it was a day to chill out after the last few days. During the first part of the day we spent quite a bit of the time just watching the world go by, or at least the Painted Ladies. There were not as many as on Bodmin Moor, but we saw dozens of them pass the bungalow, this time heading south. The southern boundary of Pinetrees is marked by a row of tall conifers (seen to the left of the picture above), and it was fascinating to watch many of the butterflies fluttered low across the ground between the bungalows and then climbed almost vertically to get over the trees. 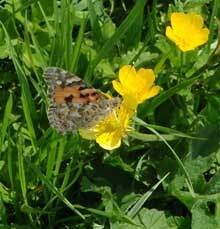 Others chose an easier route, funnelled through a gap in the hedgerow in front of our bungalow. In the afternoon we spent a couple of hours down at Porthallow and the butterflies were there too, some of them finding their way back out over the sea. I read in the newspaper that this unusually large migration of Painted Lady butterflies started in Morocco (North Africa) with heavy winter rains producing ideal conditions for breeding. Large numbers of adults them moved into Spain and southern France and produced offspring there, millions of which have continued the move northwards, to include, as far as I can tell, all parts of the UK and Ireland - amazing! And if the summer weather is good (as the forecast suggests it should be) they are likely to produced another generation (or more) here. 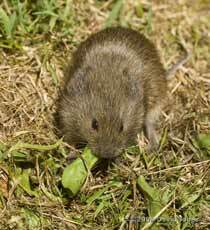 As for the vole - I set up a camera to photograph it (them? ), and one appeared in the right spot at 8.05pm. However, (and I blame my weariness for this) I had been playing around with the settings on my ring flash and hadn't reset it afterwards. As a result it was set to second curtain synchronisation. I know that sounds a bit technical, but what it means is that instead of the flash going off as soon as the camera shutter opens, it waits until just before the shutter closes. Even with a shutter speed of 1/200sec that was a mistake that allowed the vole to react to the sound of the shutter before the flash went off, leaving me with a blurred vole in sharp surroundings! 2 June - The blue skies continued, and we spent much of the day down at Lizard Point where we had our first sightings of the Choughs this year (as well as more Painted Ladies!). 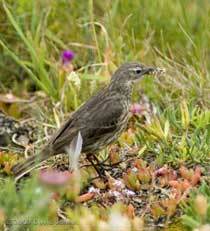 The Choughs are nesting here for the eighth year and have four chicks (2 male 2 female). These are due to fledge in three or four days time so we can look forward to seeing them next week. Back at the bungalow the Painted Ladies were still passing through, although in diminished numbers. The area around us is busy with bird activity. There are at least a couple of Blackbird pairs competing for the worms etc that are to be found in the areas of grass between the bungalows, and while the adults are taking food back to unseen broods there are also immature individuals who must be from earlier broods. The bungalows themselves provide homes to House Sparrows, Swallows and House Martins, including a House Martin nest under the eves of our bungalow, so low that you can just touch it from the ground. I get the impression that the Martins may not have actually started nesting in there, although they made occasional visits, even when we were sitting just a couple of yards away. There is obviously competition between the Martins and the House Sparrows. I saw a Sparrow try to protect the nest from the Martins, and Pat, the owner of Pinetrees tells me that he has found some Sparrow chicks on the ground under another House Martin nest. In the evening I set the camera up to photograph the vole, this time with the flash set correctly, but Sod's Law came into force and after nearly three hours I gave up after not a single vole made an appearance out of any of the four known entrances! 3 June - Another glorious day, with the temperature over 25C in the afternoon, although I'm really weary and so we did very little apart from spending a couple of hours down in Porthallow Cove. 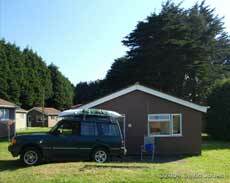 The kayak remains locked to the Discovery roof rack and my wetsuit in the bungalow. The day started with a sad wildlife note. 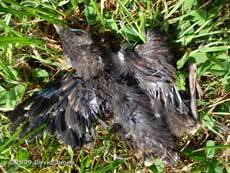 After seeing all the Blackbird activity yesterday it was disappointing to find five dead Blackbird chicks on the ground this morning. Their flight feathers were still largely confined to their sheaths so it was clear that the nest (where ever it is) had been raided. There was no sign of anything having attempted to eat them so suspicion has to fall on one of a couple of cats that visit the property (Pat does not own a cat). 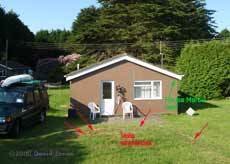 A short distance form the cottage is a post supporting power lines that cross the site. In previous years it has also provided a home for Great Spotted Woodpeckers, but this year this House Sparrow male seems to have laid claim to it for his family. 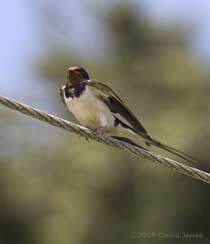 The power cables themselves provide perches for a small number of Swallows that nest elsewhere on the Pinetrees site. The numbers of Painted Ladies continues to drop, but they are still passing the bungalow and can still be seen flying out to sea from Porthallow beach. However, when the tide is in and the energy is out, so to speak, Porthallow always (weather permitting, of course) offers a great view across Falmouth Bay. About 11km across the water, at the entrance to Falmouth harbour is St. Mawes, and today the atmospheric conditions gave the harbour a strange cliff-like appearance. 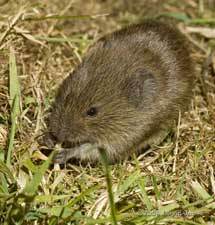 My attempts to photograph the vole this evening were just a bit more successful that last night. 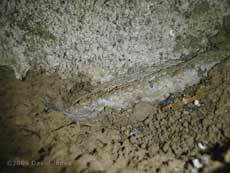 I set up both cameras to cover two of the holes and managed one picture at around 8.10pm. Sadly, it was not very sharp! 4 June - Well, the weather is changing, although the effect was pretty limited here. The only difference today was a stronger breeze that kept the temperature down a few degrees, although the effect of the sun was undiminished. The day began with a real (if frustrating) start. 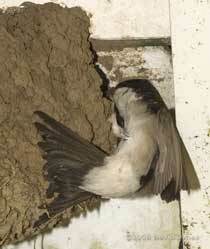 I was outside by 7.30am to watch the House Martin activity around 'our' nest. I had both cameras set up to capture some pictures, and as I sat there with the Martins often flying within a couple of feet of me I had a one of those 'Waw' moments when a Red Kite flew past slowly, right across in front of me, back-lit by the sun and just beyond the hedgerow boundary of Pinetrees. This is the very first time that I've seen a Red Kite but there was no mistaking it - very big with wings more slender than those of a Buzzard (wing span can can be 1.6m), and the unmistakeable deeply forked tail. There are no resident Red Kites in Cornwall. 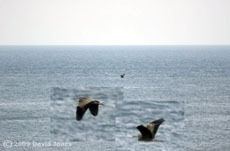 Later in the day I spoke to an RSPB representative down at Lizard Point who told me that three Kites were seen yesterday and that they are migrant birds that are passing through the county - I should have asked where they are coming from/going to, and I must do that the next time I'm down at the Point. 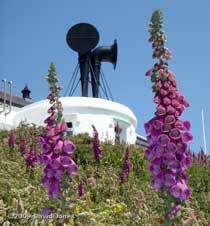 In the area below the Lizard lighthouse, two plant species tend to stand out from the crowd, so to speak. 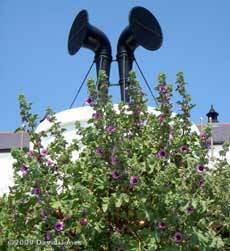 and also in the same area, the Tree Mallow, which can tower over head-height. Back at the cottage for the evening it was fascinating to watch the House Martins at such close range as they seen to completely disregard the fact that I was sitting, or even standing just 8-10ft away. 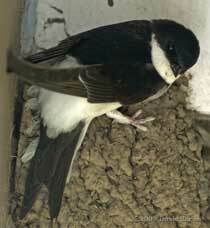 There are no eggs in the nest, and no sign of nesting materials in there, and there are at least six Martins involved in the activities around the nest. 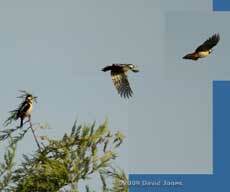 Often there is interaction between pairs of birds both at the nest itself and in the air. With the nest so low and tucked behind a low facia board, the birds have to swoop very low as they approach, sometimes virtually touching the grass before heading up towards the nest. Again, a House Sparrow became involved, and this time it entered the nest just once while there were still two Martins inside! 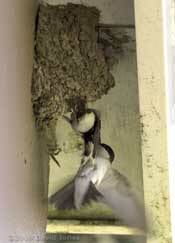 A check of the nest while they were away revealed no sign of nesting materials. The highlight of the evening was when the vole became active and I was able to take my first decent photographs of it. The exit featured in that first picture is quite large, between pieces of old building rubble, however, the other three were quite neat, round openings measuring around(!) 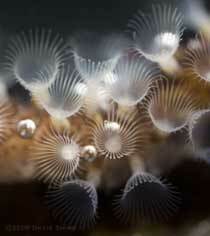 2cm across. 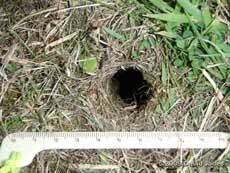 This picture shows the positions of the vole's entrances in front of the cottage (with one camera still aimed towards the Martin nest). 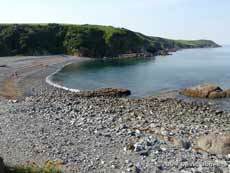 5 June - A very slow start, and a lot of time down at Lizard Point. The Chough offspring were seen for the first time during the morning, but they were safely away back in their cave by the time we arrived. Before heading for the Lizard we spent a short time down Porthallow where I spent a short time taking some photographs of bryozoans on seaweed. It wasn't a particularly successful session, and this was about the best I managed! Once down at Lizard Point I spotted an interesting sight while we were having coffee. We are used to seeing sea birds passing by, especially Gannets and Cormorants, but today I spotted a Grey Heron heading out to sea in a direction that would have taken it towards the Bay of Biscay! However, it was mobbed by some Greater Black-backed Gulls and spent the best part of twenty minutes going round in a large circle very close to the sea surface, hitting the water at least a couple of times. A few minutes later I saw what was probably the same bird, still heading out to sea, but this time on course for Brittany. This time it flew unhindered and eventually disappeared into the distance. Once back at the cottage the House Martins were active in the early evening, and once again entertained us with their low flying. This one brought mud to patch the nest rim. 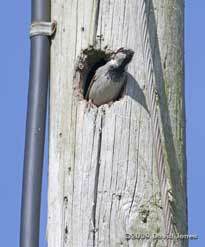 I've continued to watch out for Woodpecker activity, but it seems that the Sparrows have the post to themselves. The only Woodpecker I've seen so far was this one as it flew off from trees behind the owner's house. 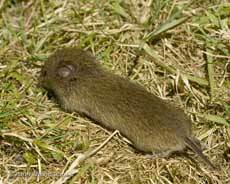 Once again it was the vole that took up much of my attention during the evening. As soon as I could after our return I set up a low hide for myself near what appeared to be the main entrance and waited. It was worth the effort when a nose appeared at the surface at just before 8pm. 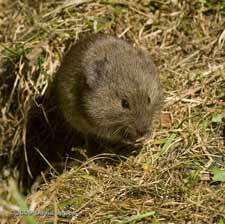 At no time did the vole venture far from the entrance, only going far enough to reach the nearest green foliage. Often it would hold thin items, like a blade of grass, between its front paws as it nibbled. I believe that it is a Field Vole rather than a Bank Vole, the latter being redder in colour and with more prominent ears in photographs that I've looked at. As this picture shows, it has a very short tail. At no time did I see a second individual. 8 June - The good weather continues, but I have been struggling to do much at all over the last few days. Just one picture from yesterday, another close-up of one of 'our' House Martins. We headed down to Lizard Point this afternoon, and while there were no opportunities to photograph the Choughs, I did get a chance to watch this Rock Pipit gathering insect larvae for an unseen family. 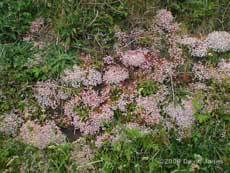 Before returning to the cottage we went on a short drive, and to the side of one stretch of road the stone walls had some very nice areas of Stonecrop plants in full bloom.